ROGERS® Ultima CR50 is the top of the line lowbed with an unmatched load concentration. Its low deck height with the "bucket pocket" and "boom trough" give better overhead clearance when hauling an excavator. Pictured Options: Center boards installed and front folding ramps. ROGERS exclusive "Croucher"® front deck design has beams tapered top and bottom for an extra low loading angle; and concealed beam hooks ease worry about loading damages. When hauling an excavator, the "bucket pocket" and the "boom trough" create an open design that helps lower the clearance height. 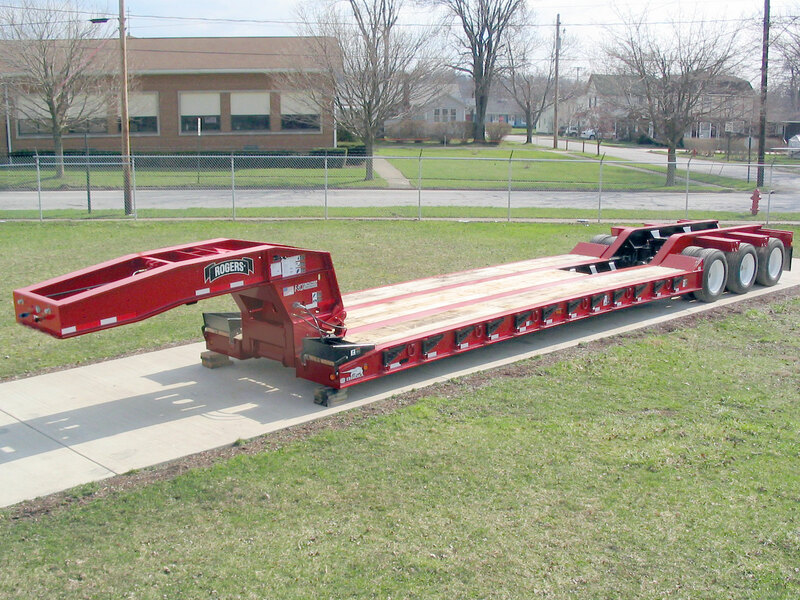 The "No Foot"® Tower style gooseneck has heavy-duty lifting capacity to easily handle a loaded trailer. The gooseneck's built-in "hat box" fits over the fifth wheel to give turning clearance for tractor fenders. Pictured Options: Air lift on the 3rd axle, wheel covers, and aluminum wheels.